Hanhart introduced their first single button chronograph in 1938 which was then known as Calibre 40. A single button chronograph provides ease of use in that one pusher is used to start, stop and reset the chronograph. Even today Hanhart continues to produce in-house the movement modifications necessary to incorporate the single button function by using an erosion machine to modify the cam. With so many watch brands producing chronograph watches, it's refreshing to see Hanhart taking the lead with the single button complication in much of their collection. Besides ease of use, this design attracts a great deal of interest as a conversation point since the functions differ from a standard chronograph. 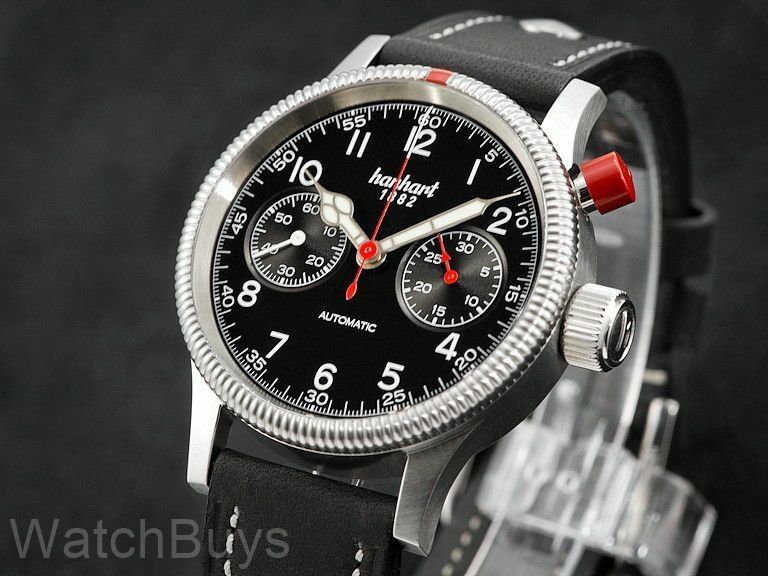 The distinctive red pusher is a Hanhart trademark and dates back to early Hanhart pilot's watch designs. This bi-compax chronograph features a 30 minute register at 3 and small seconds at 9. The case is in stainless steel and is fitted with a fluted bi-directional rotating bezel with red indicator. This watch is water resistant to 100 meters and is fitted with a vintage black riveted calf skin strap with tang buckle.